WASHINGTON, DC, March 31, 2010 (ENS) – Two Shell Chemical companies have agreed to install pollution reduction equipment on two petroleum refining facilities at an estimated cost of $6 million as part of two comprehensive Clean Air Act settlements, the U.S. Environmental Protection Agency and the Justice Department announced today. Shell Chemical with headquarters in Houston, Texas and Shell Chemical Yabucoa based in Puerto Rico will also pay a combined $3.3 million civil penalty to the United States as well as to Alabama and Louisiana, and $200,000 to Louisiana organizations for environmental education and emergency operations. The two companies are subsidiary corporations wholly owned by Royal Dutch Shell. Under the settlements, Shell Chemical will apply new air pollution control technologies to reduce emissions from some of the largest emitting units at its petroleum refining facilities in St. Rose, Louisiana and in Saraland, Alabama, located outside the city of Mobile. Shell Chemical Yabucoa operates a facility in Yabucoa, Puerto Rico. For independent business reasons, Shell Chemical Yabucoa decided to shut down its refining operations at the facility in Puerto Rico in the summer of 2009. The company still continues to operate the existing gasoline terminal there. The two refineries in Alabama and Louisiana, and the terminal operation in Puerto Rico also will upgrade their leak-detection and repair practices to reduce harmful emissions from pumps and valves. 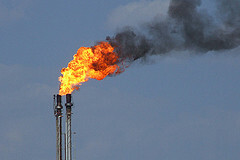 The refineries must implement programs to minimize the number and severity of flaring events and adopt new strategies for ensuring continued compliance with benzene waste requirements under the Clean Air Act. Together, both settlements will reduce air emissions of sulfur dioxide, nitrogen oxides and other pollutants by more than 1,450 tons per year, the EPA estimates. The annual emission reductions from all three refineries, including the emissions associated with the shutdown at Yabucoa, are estimated to be 645 tons of sulfur dioxide and 813 tons of nitrogen oxides, as well as additional reductions of volatile organic compounds and benzene. Nitrogen oxides and volatile organic compounds mix with sunlight to cause ground-level ozone, or smog. Nitrogen oxides “can cause acid rain, particulate matter, global warming, water quality deterioration, and visual impairment,” the EPA explains. Children, people with lung diseases such as asthma, and people who work or exercise outside are susceptible to health effects of NOx such as damage to lung tissue and reduction in lung function. High concentrations of sulfur dioxide affect breathing and may aggravate existing respiratory and cardiovascular disease, the agency says. Sensitive populations include asthmatics, individuals with bronchitis or emphysema, children and the elderly. Sulfur dioxide is also a primary contributor to acid rain. EPA has classified benzene as a human carcinogen. As part of the settlement, Shell Chemical will donate $100,000 to Louisiana Department of Environmental Quality to support the production of educational campaigns that promote awareness of illegal dumping, stormwater construction activities, and ozone nonattainment. Shell Chemical will donate $83,370 the St. Charles Parish Emergency Operations Center for the purchase and installation of two additional AM radio emergency transmitters and emergency signs for the Montz area, and will also donate $10,000 to the Audubon Nature Institute of New Orleans to support its Teacher Workshops on Environmental Education program. The settlements are the latest in a series of multi-issue, multi-facility settlements being pursued by the EPA under its National Petroleum Refinery Initiative. With today’s settlements, 102 refineries operating in 30 states and territories are now covered by settlements, representing more than 89 percent of the nation’s refining capacity. “These two settlements are excellent examples of businesses working with government to achieve compliance at their facilities around the country, which will benefit the health of local communities and the environment,” said Ignacia Moreno, Environment and Natural Resource Division assistant attorney general. The states of Alabama and Louisiana actively participated in and are joining in the settlement with Shell Chemical, which was filed with the U.S. District Court for the Southern District of Texas. The settlement with Shell Chemical Yabucoa was filed with the U.S. District Court for the District of Puerto Rico. Each settlement is subject to a 30-day public comment period and approval by the federal court.